It’s Tuesday morning and the busy little bustle of Paris is back. Car horns are tooting, jackhammers are pounding, high heels are clacking… After a three-day weekend, the city’s gone back to full speed. I’m still savoring the first balmy evenings of almost-summer, though, and thinking about ice cream. Last night Parisians were on their way back into the city. For many, the end of a long weekend means sunburns and sand between the toes, empty picnic baskets and tired hiking boots. It also means traffic jams coming into Paris. From 3pm to 8pm yesterday the highways were classed orange (not as bad as rouge, but getting close), which basically means almost everyone was trying to enter the city at the same time. We opted not to join the crowd at the toll booths and instead waited in line at what I consider the best ice cream shop in Paris. Gelati d’Alberto makes homemade Italian-style gelato that is worth a trek from any part of the city. Gelato has gotten big in Paris over the last few years and, of course, we’ve tried many of the numerous offerings. I certainly hesitated before choosing an official favorite glacier, but the caramel au beurre salé (a new flavor I had never tried before) combined with café (my staple) sent me over the top. 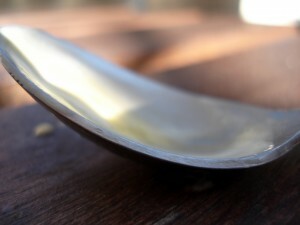 Beurre salé means “salted butter” and adds a delightful tang to sweet caramel. What I especially like about this gelato is that it is more flavorful and less sugary than many traditional ice creams I’ve tried. Gelati d’Alberto’s is especially light and airy and, in place of the customary scoops, they serve it in the shape of a rose. Unlike the toll booths, I don’t mind waiting in line for gelato. It takes me about that long to decide between the different flavors. According to the sign posted at the front door, Gelati d’Alberto makes 36 different parfums. Among my favorites are chocolat, nocciola (hazelnut), and baccio (chocolate and hazelnut!). I’d also recommend the sorbets, such as passion fruit, lemon, grapefruit, blackberry or coconut. I noticed they even had lychee, a sweet fruit originally from China that is very popular here in France. Gelati d’Alberto has two locations in Paris: one in the Marais (12, rue des Lombards, 75004) and one in the Quartier Latin (45, rue Mouffetard, 75005). I have a little preference for the latter- simply because you can walk with your cone from the parlor up to the Panthéon and watch the sun set behind it’s majestic dome- not a bad combination. Hi Joy, I ran into your Mom and Kira yesterday. Kira’s so grown up and beautiful. They gave me an update on all. Sounds like life is good. Take care, melissa PS love the blog.